CAPE CANAVERAL, Fla – While the Horizontal Integration Facility or HIF might sound similar to the Vertical Integration Facility or VIF – the buildings requirements and lay out could not be more different. Unlike the VIF, where the Atlas launch vehicle is lifted into the vertical position for launch, the launch vehicles remain on their sides in this structure. Upon first entering the HIF, one sees what appears, upon first glance, to be a mundane warehouse type of structure. Those similarities cease when one enters the bays that contain the Delta IV rocket. The one resting within the facility now is destined to launch the Wideband Global SATCOM or WGS satellite, currently on track to lift off from Launch Complex-37 early next year. In preparation for launch a rocket’s first and second stages are brought into the HIF along with any solid rocket boosters that will be needed for that mission. These components are then assembled and the fully-assembled launch vehicle is then ready for the move out to the launch pad. Whereas the VIF’s many decks, shrouds and layers obstruct one’s view of the rocket – nothing is left to the imagination at the HIF. The Delta IV sits out in the open. Visitors are able to walk completely around the massive rocket. The HIF is seven-stories tall, white and is comprised of two bays that measure about 250 square feet by 100 feet each. To ensure that the launch vehicles that are brought into the building are kept level – the floors of the HIF, at most, differentiate only about 3/8 inch. This makes the HIF’s floors the most-level in the U.S. In both the VIF and the HIF, the one thing that was apparent was that these are places where work is occurring. 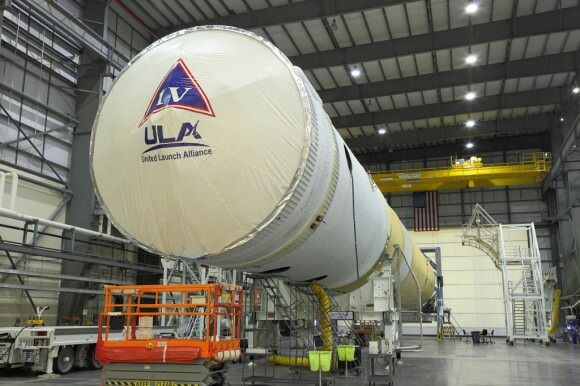 At both sites, United Launch Alliance workers were actively working to ensure that the Atlas V at the Vertical Integration Facility and the Delta IV at the Horizontal Integration Facility were ready to lift their individual payloads to orbit. The WGS is tentatively scheduled to launch early next year (no firm launch date has been announced). WGS 4, 5 and 6 are under construction by the Boeing Company, they will be deployed over the course of the coming years. Like WGS 3 was also launched atop a Delta IV. These satellites are the Block II version of the WGS. 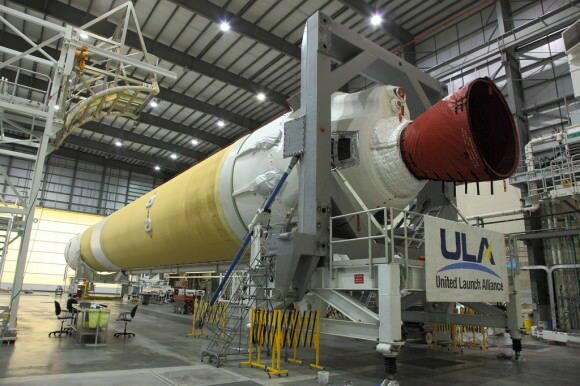 To get a better idea of what it was like inside of United Launch Alliance’s Horizontal Integration Facility, please check out the video feature below. This package contains a large amount of information provided by United Launch Alliance’s Mike Woolley – including a funny story – that could only happen in Florida. Here Kitty, Kitty! Oops.. not a kitty…. GROWL! ER! LOL! Imagine that poor techie… steppin on a gator.. sheesh.. Coffee? No thanks.. I’m awake now! What surprised me that that it was all aluminium or something very light. I started to get afraid that I poked a hole in it.